We provide a useful summary of your account activity on your account profile page in the Incoming Traffic graph. 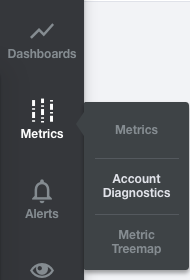 You can navigate to this by selecting the “Account Diagnostics” submenu from the “Metrics” tab. The Your Traffic card provides a quick overview of your recent traffic. 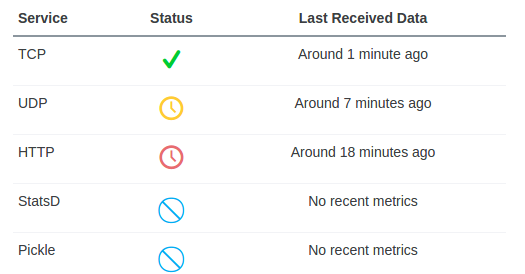 The icon in the status column provides information on your last received data. The green icon indicates that we have seen data arrive recently on that interface. The yellow and red icons show that no data has arrived on that interface for at least 5 and 15 minutes respectively. The blue icon indicates that we have never seen any traffic on that interface. In the graph above, the orange line is the live metric limit - the number of metrics you can update in a rolling 5-minute period. One metric name might look something like ‘my.server.cpu.load’. In this example it is set at 10,000, allowing 10,000 metric names to be sent at the same time. The yellow line is the number of live metrics incoming for the account, on this graph it fluctuates between around 5,000 and 6,000 live metrics. When we see more than the limit sent at the same time, some metrics will be dropped. Note: Live metrics are sometimes also called concurrent metrics in your traffic dashboard. In the graph above, the green line is the number of data points allowed per second, or the datapoint rate limit. In this example it is set at 400,000, allowing the user to send 400,000 data points a second. The orange line is the total number of datapoints per second received associated with the account. TL;DR - As a prevention measure against accidents and malice. It’s possible for a user to run a script which accidentally (or deliberately) updates millions of metrics a second. Sensible limits on what data we process ensures that one customer cannot affect the quality of service for others. For our paid accounts, we monitor and increase any limits as necessary. In general, we want any customer to be able to send data at a high rate.